The parish of Bridgham is situated in southern Norfolk, east of Thetford, the River Thet defining part of its southern boundary. Its name comes from the Old English for ‘Homestead by the bridge’. The parish has a long history, and had certainly been in existence for some time by the time of the Norman Conquest, its population, ownership and productive capabilities being set out in the Domesday Book of 1086. There is evidence of human activity in the parish since at least the Neolithic, and possibly before then, the earliest dateable find being a flint blade that could be late Mesolithic or early Neolithic (NHER 11436). Definitely Neolithic flint tools found include a polished axehead (NHER 17717), a point (NHER 6078) and flakes (NHER 22036 and 23297). During the gradual transition from the Neolithic to the Bronze Age, flint continued to be used (NHER 5990), but increasingly copper alloy became the preferred tool material. Two such tools have been found in the parish, an axehead (NHER 6012) and a palstave (NHER 35224). There is also evidence of the burial practices of the time, which were characterised by the use of circular burial mounds or round barrows, in which cremations or inhumations were placed. The remains of one of these barrows (NHER 6011) were excavated in the 1950s, uncovering an inhumation and two cremations, together with pottery fragments and a shale ring. Further evidence exists in the parish for the continued use of particular areas to bury the dead. Ploughing in 1953 revealed Bronze Age and Iron Age pottery fragments with cremated human bone, probably the site of a cemetery in use over many years (NHER 6013). As is usually the case, individual finds from the Iron Age are fairly scarce, and in this parish consist of two coins (NHER 15283) and pottery fragments (NHER 6014 and 17183). The period of the Roman occupation seems to have been one of much activity. Peddar’s Way Roman road (NHER 1289) ran north to south through the western part of the parish, and a whole town grew up on either side of it (NHER 5653), investigations revealing the presence of buildings, domestic artefacts and two coin hoards, together with a cemetery. The site of the town was later reused as an Early Saxon cemetery. There is also evidence of a Roman house, possibly a villa, at (NHER 18066). Individual Roman finds from elsewhere in the parish include coins (for example NHER 6016, 6040 and 11456), brooches (NHER 15282) and pottery fragments (NHER 18066). The ensuing Saxon period has left far less evidence, though it is clear from the reuse of the Roman town as a cemetery (see above) that the area was settled at the time. Individual finds include a couple of brooches (NHER 6018 and 15656), pottery fragments (NHER 17183 and 18066) and a loom weight (NHER 17183). 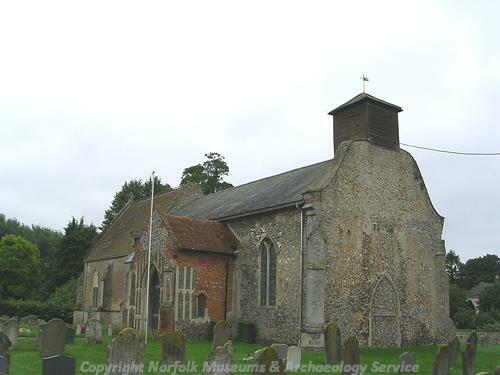 The medieval period following the Norman Conquest has left the parish with its oldest surviving building, St Mary’s church (NHER 6050), a 14th century nave and chancel with a 15th century north porch. There are traces of a fallen west tower, but the bell is now housed in an aerial shed on the west nave roof. Inside, there is a Norman font, traces of 14th century stained glass in the north windows of the chancel, and a disused 13th century bell, one of the oldest surviving examples in the country. Other buildings have not survived, but have left a footprint, such as their surrounding moat (NHER 18066). There was also a medieval stone cross at the time (NHER 6037), mentioned in contemporary documents, though no sign of it exists today. 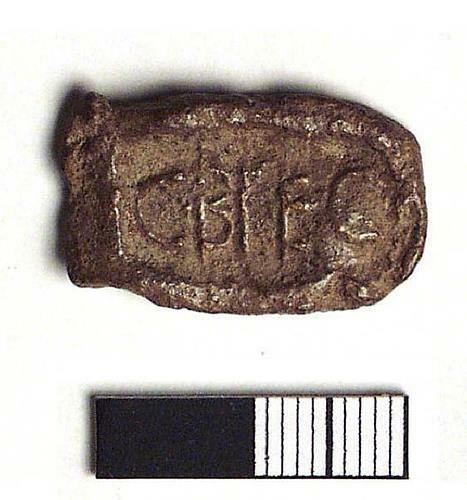 A fragment of cross was found in 1935 (NHER 6036), and it is possible that this may have been part of it. Individual medieval finds include a coin (NHER 15656), a brooch (NHER 28761) and a gold ring set with a sapphire (NHER 33167). The oldest surviving post medieval building is probably the timber framed thatched cottage NHER 18067, which is 17th century or earlier. The Grove (NHER 19253) is an early 17th century high quality house, later altered and extended. The Old School House (NHER 41274), now a private residence, was, as its name suggests, a school, dating to the mid 18th century. Mill House (NHER 42006), was probably built in the early 19th century at the same time as a now demolished post mill (NHER 15990). The most recent entry for the parish is a World War Two concrete pillbox (NHER 32705), built in about 1940 as part of the anti invasion defences of the time. Pieter Aldridge (NLA), 29 November 2005.